A few years ago, we took a weeklong cruise during the summer with the kids, on Carnival and had a great time. We and the kids would much rather cruise on something that is not so driven to get people into the bars. We have always wanted to cruise on Disney, because we’ve heard such good things about it. But a week long on a mouse boat, quickly depletes our annual vacation budget. 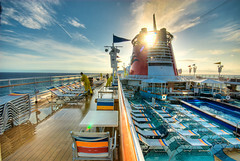 Every week or so, I check www.VacationToGo.com to see prices on cruises. I did my normal searches, not expecting anything, or so I thought. I Searched for 7 day cruises from Florida during the summer, then sorted the prices ascending, then I saw what I though had to be an error: seven day Eastern and Western Disney cruises for $599. Holy cow. I immediately went to Travelocity to try to confirm it. After quickly verifying on there, I began to book it, but the price came up as $6000 for one room. Apparently, the $599 price is for rooms without pullman (folddown) beds, that sleep a maximum of three people. So, I had Jennifer call VacationsToGo directly and confirm the $599 price and get two cabins if it is for real. Sure enough it was real, and we are now putting the New England vacation on hold for a year or so. We ended up getting two inside cabins for the only $2,600. Even the travel agents we worked with were blown away at the price, stating they had NEVER seen Disney this cheap. This price is actually considerably lower than I paid for our last seven day Carnival cruise, which I got dirt cheap with my veterans discount. I tried to spread the word as fast as I could before the deal ended. Our friend also booked with her two daughters for the same cruise. My brother-in-law tried too, but no more cabins were available on that cruise. But instead of passing up the deal, he is cruising one week earlier for the same price. The current price on this cruise is $1,400 for an inside cabin and brochure rate is $2,099. The current going rate of is about average for this cruise, which truly shows how good of a deal $599 is. So in a few months we will be heading to Key West, Grand Cayman, Cozumel, and Disney’s private island. So if you have any recommendations for shore excursions, please leave a comment. We’ve been to Cozumel, but the rest are all new territory for us.